Hebrew grammarian, poet, translator, and philosopher of the fifteenth and sixteenth centuries. Being a native of Lisbon, he called himself "Sefardi"; but he left his native country long before the expulsion of the Jews. He lived for a time in the Levant ( ), then went to southern Italy, and died in the beginning of the sixteenth century. As grammarian he was under the influence of Efodi, who endeavored to base Hebrew grammar upon logic. He wrote a grammatical work entitled "Peraḥ Shoshan" (British Museum MS. No. 2857), quoted by Ibn Ḥabib himself in "Darke No'am," and frequently by Abraham de Balmes in "Miḳneh Abraham." This book is divided into seven sections ( ), each consisting of a number of chapters ( ). 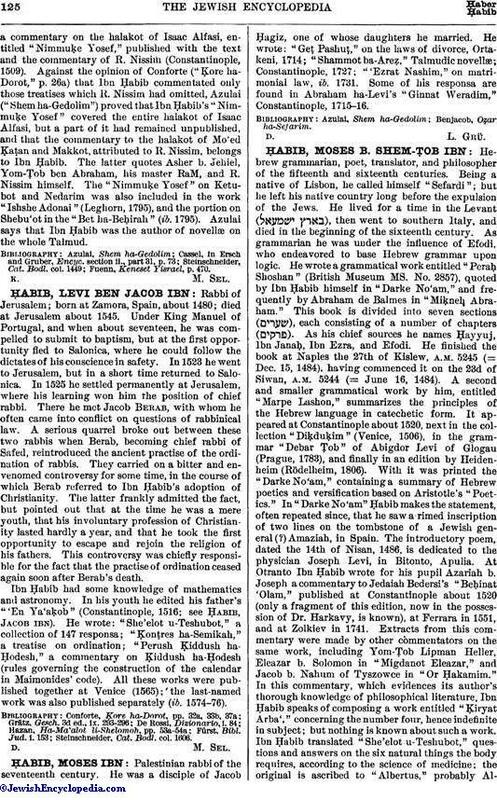 As his chief sources he names Ḥayyuj, Ibn Janaḥ, Ibn Ezra, and Efodi. He finished the book at Naples the 27th of Kislew, A.M. 5245 (= Dec. 15, 1484), having commenced it on the 23d of Siwan, A.M. 5244 (= June 16, 1484). A second and smaller grammatical work by him, entitled "Marpe Lashon," summarizes the principles of the Hebrew language in catechetic form. It appeared at Constantinople about 1520, next in the collection "Diḳduḳim" (Venice, 1506), in the grammar "Debar Ṭob" of Abigdor Levi of Glogau (Prague, 1783), and finally in an edition by Heidenheim (Rödelheim, 1806). 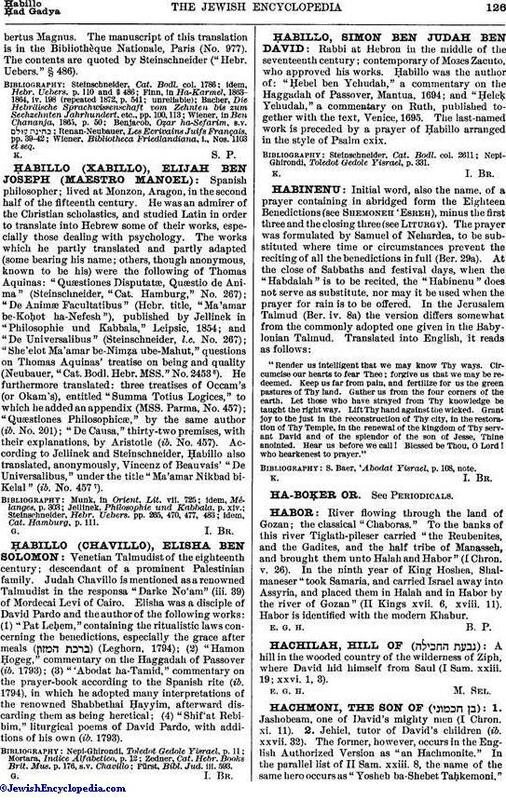 With it was printed the "Darke No'am," containing a summary of Hebrew poetics and versification based on Aristotle's "Poetics." In "Darke No'am" Ḥabib makes the statement, often repeated since, that he saw a rimed inscription of two lines on the tombstone of a Jewish general (?) Amaziah, in Spain. The introductory poem, dated the 14th of Nisan, 1486, is dedicated to the physician Joseph Levi, in Bitonto, Apulia. At Otranto Ibn Ḥabib wrote for his pupil Azariah b. Joseph a commentary to Jedaiah Bedersi's "Beḥinat 'Olam," published "at Constantinople about 1520 (only a fragment of this edition, now in the possession of Dr. Harkavy, is known), at Ferrara in 1551, and at Zolkiev in 1741. Extracts from this commentary were made by other commentators on the same work, including Yom-Ṭob Lipman Heller, Eleazar b. Solomon in "Migdanot Eleazar," and Jacob b. Nahum of Tyszowce in "Or Ḥakamim." In this commentary, which evidences its author's thorough knowledge of philosophical literature, Ibn Ḥabib speaks of composing a work entitled "Ḳiryat Arba'," concerning the number four, hence indefinite in subject; but nothing is known about such a work. Ibn Ḥabib translated "She'elot u-Teshubot," questions and answers on the six natural things the body requires, according to the science of medicine; the original is ascribed to "Albertus," probably AlbertusMagnus. The manuscript of this translation is in the Bibliothèque Nationale, Paris (No. 977). The contents are quoted by Steinschneider ("Hebr. Uebers." § 486). Wiener, Bibliotheca Friedlandiana, i., Nos. 1103 et seq.